I had a few emails and twitter DM’s over the Worlds Strongest Man 2017 post I made, unlike my WSM 2016 I didn’t include the break down of times on the events, I am going to include that below. There seems to be some controversy over the Georgian Bull Konstantine Janashia‘s Traps / Shoulders. Firstly, Lets talk about the Georgian Bull aka Konstantine Janashias Traps / Rhoms / Delts / Neck / Shoulders, while having traps and /or an upper back that developed isn’t especially unusual for a strongman. All those shrugs, dead lifts, farmers walks, and more all with huge weights will have them explode in size. Having a more pronounced set of muscles isn’t anything especially out there when your body mass and body fat isn’t exact huge comparatively speaking to say Eddie Hall or Zydrunas Savickas. 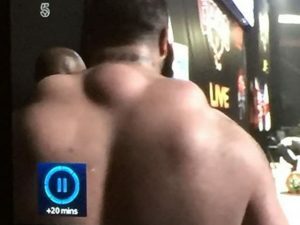 In one of the heats Colin Bryce commented on Zydrunas Savickas power-shelf or power-belly saying its (his stomach) is actually quite bizarre, his stomach looks like its fat but its actually rippling muscles under there. Its entirely possible his traps are just pronounced due to a lower body fat, I would speculate there are some sort injury at play, almost like callous on your hands. All the squats have caused his spine and shoulders to protect themselves. I had this happen on my shoulder, I had a swelling around my AC Joint, which looked a little like a tennis ball cut in half. Its fluid an tissue swelling to protect the bone edges. I would speculate there are a collection of issues all converging in one place for this to occur. Firstly I think much like Arnold Schwarzenegger’s “peaky” biceps (Left), or Dexter Jacksons ear warming traps, Janashia just had oddly shaped traps. Secondly his lower than average strongman body fat makes them show up much more, Thirdly all the squats and axles and such have aggravated his spine and shoulders. This trinity of effects or issues has resulted in the unusual and pronounced shape of Konstantine’s traps. And secondly here is the break down for each event. This is the 40th Anniversary of Worlds Strongest Man, we already know the outcome of Worlds Strongest Man 2017, it spread like wildfire across Britain when Eddie Hall brought it home after 24 yrs away, even if there was a little controversy. We can finally watch for ourselves and see what the fuss was about. I’m not entirely sure if Hafthor had been allowed that extra rep, if it would have been a win for him. What has been clear through the qualifiers and heats has how the sport is changing, looking at the incoming talent is slowing leaner, more explosive and almost as powerful athletes. More interestingly has been those monster power houses of old who have lost a heap of weight and look amazing all lean and trim. At first it appears the price of this lean figure is their raw-power, we all know Mass-Moves-Mass. Lean isn’t really what you think about when you think Strongman, I still find it hard to imagine Eddie Hall was an Olympic level swimmer, but you certainly don’t think CrossFit would go hand in hand with a current Strongman legend. When I heard about such a thing, it wasn’t clear who it was, but I discovered it was Britain’s own, the one and only Mark Felix. I spoke to Mark Felix a few years ago when I heard this rumour, thinking someone was playing a joke on me. Yeah Yeah Usain Bolt is powerlifting too, it just did not make sense. However the British Legend was happy to have a little chat with me at an event and I pondered would his strength and raw power was the price. Initially this did seem the case, but sadly he retired from WSM after ripping the bicep head clean off the bone. Heartbreakingly his year won’t be the year he breaks his own world record 9 appearances in the WSM Grand Final. He was one of many many who this year was taken out with injuries but he seemed to be going well and regaining his lost strength, but we didn’t see his full potential. Another such person is another of Britain’s Legends, Terry Hollands who has lost a heap of weight resulting in an impressive transformation complete with a 6 pack. A huge part of this seems to be from the amazing Kate Errington (Left) kicking him up a gear. Watching the WSM TV coverage of the qualifiers and it was looking a little like that 6 pack may have taken the powder keg of explosives out of him. This trend doesn’t carry over to the actual heats where he’s putting in a killer performance. One of the most memorable was his part in the final event of the qualifiers. Terry recently posted to say he’s getting back the strength he lost and getting stronger all the time. Watching the changes from Qualifiers to Heats, you can see this power coming back for sure, over just a few months. The changing landscape of Strongman is starting to make the mammoth guys a little outmoded, Felix and Hollands could well be ahead of the curve. The advent of Last Man Standing this year saw Matjaz Belsak and Terry Hollands put in some stand up performances, both stuck in my mind. This changing landscape will certainly favour the fitter guys like Britain’s Terry Hollands, Russia’s Mikhail Shivlyakov, USA’s Martins Licis and Poland’s Mateusz Kieliszkowski. The latter three along with the raging Georgian bull Konstantine Janashia are very clearly the next generation of Big Z, Shaw and Hafthor, and Iron Biby maybe the next OD Wilson, certainly the same crazed power. This new final event of the heats, is basically a 160kg Atlas Stone, which is usually the middle ball of 5, has to be lifted up 4ft 6in and passed over the bar. Each man then has 10 seconds to pick it up, and pass it back. The 10 seconds both starts and ends the moment the stone hits the floor on each side. There is a good sportsmanship rule about about dropping the ball inside the centre square to give the other man a better chance but some didn’t observe this. If the ball rolls around the ring, precious time and energy are wasted stopping it and returning it to the square to lift. This new event seemed a little unfair, some of the underdogs really pulled out something special and powered on with a display of impressive performance of raw grit and determination. I would hope this event gets a little more tweaking next year as at least 1 or 2 people who clearly weren’t the strongest survived this, and some who should have won didn’t. As Colin Bryce said all so often, this event gives everyone a fighting chance. I can see some people training almost exclusively for this and saving energy during the main events so take the win here. We saw something like this from Big Z and Hollands, only the latter performed well. This year there seemed to be way way more injuries than normal. One of the heats nearly ended with a 2 man last man sanding, they are supposed to be 2+1+1+1, but one only has 3 people left by the end. Was Mark Felix who ripped a bicep off the bone, another guy did his hamstring, another his tricep. Zydrunas Savisckas appears to be really suffering with the spinal/neck injuries and surgery, but appeared to sustain no new injuries in his possibly poorest show to date. I can’t remember who it was now, but one guy dropped like 300kg on his shoulder and just shrugged it off. I think we are reaching the limits of the current generation of strongmen. In the past Bill Kazmeier held the World Record for Deadlift in the 300kg range, then Z in the 400s now Eddie in the 500, maybe time for the the new guys in their 20s to take it up a step and pushing to the 600s. I said it last year Martins Licis (USA), Mateusz Kieliszkowski (Poland), Mikhail Shivlyakov (Russia), Konstantine Janashia (Georgia) and new man Iron Biby are very bright stars. You can see huge improvements in the former 2, and Konstantine hugely improved especially with the Atlas Stones, experience last year clear gave him the same leg up that Eddie’s taste of the podium did for him. The Russian Marine is impressive, if he carries on and packs some mass on it, he’s going to be a terrifying force in WSM. I was so hoping Big Z would hit 5x but all those injuries he has came back from, once its your spine or neck, it doesn’t look good. Geoff Capes has spoken many times about the issues he’s faced, the potential is catastrophic. If anyone in the current top tier can make it to 5x WSM, its going to be Brian Shaw. If Z doesn’t perform a miracle, Hafthor maybe getting his shot in 2019 or 2020, no Z, no Eddie, leaves a power vacuum with some impressive new blood waiting to fill it. I was listening to the Worlds Strongest Man PodCast (yeah I’m late) and they were talking about the Strongest Of All Time Strongmen, and only Eddie Hall pulled an old school strongman out of the mix (Louis Cyr) where as most others were concentrating mostly on WSM guys, which is an understandable mistake to make given the context. Brian Shaw refused to name a 3rd but gave mention to Mariusz Pudzianowski and some others, he was the only one to mention the dominator too. In short most people said Bill Kazmaier, Jon Pall Sigmarsson and Zydrunas Savickas. The latter is the more interesting one because these are his peers and they are name checking him, which is a huge thing. It would like like Jenson Button saying Lewis Hamilton is the best driver of all time. I was really surprised that they named an active strongman, but equally I loved that they did. Colin Bryce made some good points about why Brian Shaw may not be remembered for the monster that he is because he doesn’t really show off and doesn’t finish events if he doesn’t need the points. Basically he doesn’t play the crowd, he’s playing just for points and the win. I say for no reason because last years WSM 2016, there were a moment where Thor and Eddie agreed to end it on the deadlift and take equal first points. Eddie played the points because he has dislocated his fingers and we know he could have done more but he played tactics due to injury. Zydrunas on the other hand near enough threw away his win by going for a world record log press, and often shows off his brute strength. Author Saxon – Arthur Saxon were born nearly 100 years before Worlds Strongest Man even existed, he nearly envisioned the WSM TV Format and some of his world record breaking feats still stand today. 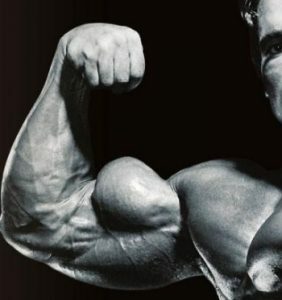 There were no steroids, no growth, no intimate muscle knowledge or training techniques, very little body building knowledge existed. Still his feats are impressive, even more so for a man his size. There were so little available knowledge that Arthur Saxon (and his brothers) wrote a huge amount of the available literature at the time on how to get fit, strong and healthy, how to build a better body and generally documenting physical culture. Much of the 100 year old advice given in his books (which are copyright free now) is still relevant today and even being touted as “new ideas” by modern science. Arthur invented the Saxon Side Bend which is one of my favourite core and abdominal moves, he used to eat like a beast, drink like a fish and even went to war with a dapper moustache. Zydrunas “Big Z” Savickas – The greatest in a long line of Lithuanian strongmen, having just turned 40 years old and holding 4 Worlds Strongest Man titles (matching Brian Shaw), with only 1 man holding more titles (The Dominator). Big Z is obviously the king of current day strongmen with even many of his peers saying the same thing. When others struggle with events at Worlds Strongest Man, you see Big Z thunder up, the ground shaking under his steps, the crowd wide eyed and he lifts the weight like it wasn’t even there an shows his peers hows its done and strolls away. I have met Big Z a number of times at various events, a fairly quiet man, doesn’t catch all that you say due to the language barrier and noise at the events but a really really nice guy and quite funny too. 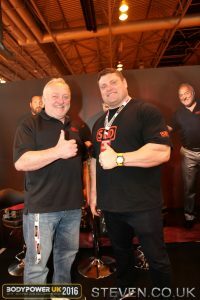 At Body Power 2017, Bill Kazmaier did the forearm flex for a photo and Big Z stood up and did the same and his forearms are HUGE and made Kaz’s look normal size so Kaz took a step closer to the camera and pushed Zydrunas back a little and just a little fooling around between 2 legends of strongman. Bill “Kaz” Kazmaier – When it comes to one of the early days legends of strongman, its all about Bill Kazmaier, while Jon Pall may have been the showman it were Kaz who were the berserker powerhouse. I will always remember his eyes bulging out like Jim Carreys Mask Character and him slapping himself in the face Rowdy Roddy Piper style getting the rage up. Much like Eddie Hall having broken the 500kg Deadlift Barrier for the World Record, Kaz were the first man to break the 400kg Deadlift barrier for the World Record. The fact they have Bill doing the commentary for world strongest man is awesome for me, along with Magnus they add some informed colour in to it. They KNOW what they are they talking about and what it takes. I’ve also met Kaz a few times and he’s also a really nice guy, and gave me a little interview a few years ago. I did want to get an interview for my blog this year when I spoke to him but he were just so damned busy when I met him, maybe next time. I haven’t really gone on too much about what they have done and what makes them the strongest because you guys can read my Arthur Saxon post and the other 2 guys are well wrote about online so I won’t cover them again. This concludes my strongest of all time strongmen #SOAT. Last year one of the top 5 had been injured and in my opinion that’s why he got the podium last year, but that little taste of the podium seems to have pushed Eddie Hall to new heights. 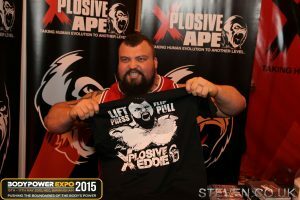 All that rarefied air drove Eddie Hall to new heights, heights so great he took the top spot to be crowned Worlds Strongest Man 2017 in Botswana. 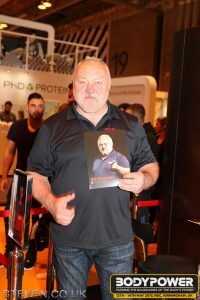 Its not all celebrations since Eddie has taken hit time on the podium to follow through with his pledge to retire from Worlds Strongest Man when he won, but remain on the British Scene. Eddie is the first British Strongman to take the Top Spot in 24 years since Gary Taylor took it in 1993, before that it was the mighty Geoff Capes almost a decade before. Eddie’s win isn’t without a little controversy (more in the spoiler), but who cares we may get some of that Olympic Mania funding around Strongman now and it will get more popular and more gym equipment, whoop. I remember back in the late 80s maybe early 90s going to the local nature park for a carnival or summer fair to see Geoff Capes, it was a huge fanfare, lets see those days again. Don’t click the following if you don’t want to know the final scores and line up: [toggle title=”Spoiler”]The top 3 were the ever predictable Eddie Hall (51 Points), Hafthor Bjornsson (50 Points) and Brian Shaw (49 Points) with only a single point separating them. Hafthor believed he should have won but lost on a referee’s decision that one of his reps didn’t count giving Hall 1 point, and the win. Had that that not happened, Thor would have won, Eddie Second and Brian Shaw Third. Thor posted on Instagram that he believed he was robbed, so little bit upset. Lets hope Eddie doesn’t end up like Oberyn Martell with a crushed head at the hands of The Mountain. It would appear that Zyndrunas Savickas’ Upper and Lower back injuries not to mention huge weight loss has reduced his odds of joining the 5x club. Maybe Colin Bryce was right when he said earlier in the year that unless Big Z stops being more like Medium Z and gets back to being Big Z his chances aren’t good (Dec 2016 in WSM PodCast). Its almost reminiscent of Mark Felix who has taken up Cross-Fit, lost a huge amount of weight and looks damned good for a 50yr old man. The price has been his raw strength, has Big Z fallen in to the same trap. Better question, is the weight loss because of his back injuries ? 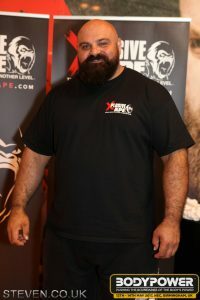 Some strong shows from other finalists, including Laurence Shahlaei who is the come back kid, having retired once now he’s back in the top 10 worlds strongest men again, sporting a rather nice beard. Its also interesting that Hafthor has made his 6 consecutive podium place, but its also a shame Mark Felix didn’t make this is 10th consecutive final, but I can’t wait to watch this when its on TV. I posted way back in August that Konstantine Janashia aka the Georgian Giant or Georgian Bull if you listen to Colin Bryce is one to watch. Watching him perform were a little tarnished, not because of anything he did or his performance, but because there were so much spectacular new talent in this years Worlds Strongest Man. It were bordering on biblical, with the 4 Horsemen riding in to town to challenge the old guard, upon the ashen horses rode Mateusz Kielszkowski, Grzegorz Szymanski, Martins Licis and Konstantine Janashia. Lots of new blood in Worlds Strongest Man this year, lots of potential and this experience will have given many a new set of goalposts and without raised them up. I’ve just re-watched it again, which makes it about the third time now. In the 825lb Frame Carry event, Janashia destroyed Brian Shaw by a huge 6 seconds, and Hafthor Bjornsson, well you’d need the Hubble Space Telescope to see across the 30 seconds gap between them, only the above Kielszkowski who pretty much sprinted the 30 meter course 11 seconds faster than Brian Shaw. In the 100kg Circus Barbell, he beat Brian Shaw again, Brian looked to be struggling and I think Janashia still had 1 more rep but ran out of time, Shaw looked struggling to match him. In the deadlift, Konstantine matched Bjornsson at 420, with only Eddie Hall, Brian Shaw and JF Caron beating him by 25kg. That 25kg did make it a new world record but you can see thus far how Konstantine Janashia is making some pretty big waves for a WSM Débutante. In the 40 Tonne plane pull, he were just 40cm between Eddie Hall, and 85cm behind taking first place, and the Kettlebell Throw he scored just 5 seconds behind Eddie Hall to gain 5 over the bar. 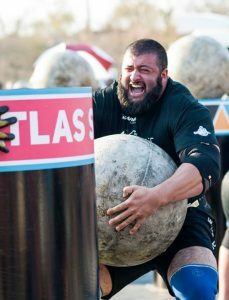 Lastly in the Atlas Stones you saw him come unstuck, he were only just getting to the 4th Stone up while Eddie Hall had near completed all 5, Hafthor, Shaw and Eddie all completed the full 5 stones up to 210kg in the time it had taken Konstantine to do just 4. The Stones is a big event based on technique, and skill to wield the strength, and he has shown he has the power, strength and speed, he just needs to hone his skills and nail that technique. You could see in this grand final that he were standing toe to toe and took a bit of a beasting but still he stood toe to toe. There were the odd event variance, where they used a Viking Press with Canoes, or Fingals Fingers for example, had ALL the competitors had the exact same -semi-final events, I think the Grand Final may have had 1 or 2 different faces. It really could have gone another way if some of the shorter contenders had Fingals, or some the weaker endurance guys the car carry. If there weren’t an injury or two during the semi’s the finals would have looked different for sure, and if Big Z weren’t out I think the Podium would have certainly been different. Really looking forward to seeing Konstantine and the other 3 horsemen excelling, I just hope this event has given a sample of the good stuff and increased their hunger. I remember feeling this way when Savickas showed crazy strength potential, the same moment when as a kid I saw Kazmaier do the original Crazy Eyes and you could see the raw passion, the same as when Pudzianowski went full on Berzerker Rage and earned the name The Dominator, exciting times. Image from Worlds Strongest Man. Brian Shaw WSM Trophy Courtesy of WSM. I have just finished watching Worlds Strongest Man – The Final, I read dozens of reviews and watched various bits of phone video from the actual event a few months back closer to the time it actually happened. Nothing compares to watching how close it were, like in the 825lb frame carry, it were a tiny mistake between Szymanski finishing before Bjornsson, or seeing how close Bjornsson came to caving his own head in trying to catch the 24kg kettlebell in from 4m drop. I delayed this post a few days, but If you haven’t watched it all yet, Channel 5 has lots of Strongman stuff on demands go there before scrolling down as lots of SPOILERS here, also check out my other posts, Mark Felix Cross Fitter and Worlds Strongest Man back in August, or Eddie Halls Documentary on Netflix or my Christmas Post on Arthur Saxon who is the daddy of strongman. Eddie Hall didn’t fair well here, I assumed the earlier injury would set the tone but wasn’t the case. He revealed later on in the show that during the frame carry one of his dislocated fingers popped out again. It didn’t seem to have a heap of impact through the event other than obvious swelling. Laurence Shahlaei overcame so many injuries to come back only to be taken out after a reasonable placement in the first event. This were the only Injury in the final, but about the 3-4 in the heats and final combined. Brian Shaw looked as though he simply lost track of time, and may have had 1 more in the tank, Eddie were maxed out I think. Martins I believe should have hit 7 but he like Shaw were just out of time. Much like the Axel later this event has been made all the harder. 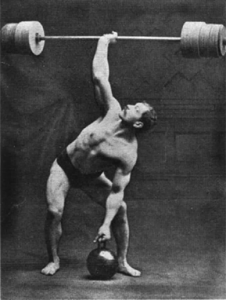 The Circus Barbell were a non-rotating barbell. If you have ever used a fixed bar, its so much harder once they start rotating, your wrists just aren’t powerful enough to fight the rotational force. 9/10 for me, its usually 1 side which gives way and recovery is near enough impossible for us normal-ish sized humans. This were a fixed Axel style barbell, so much thicker and stronger than a regulation or gym barbell. There were a few of these minor changes which added a new dimension to some of the events. In the Axel Deadlift Brian Show has held the world record since 2013, that is until Eddie Hall destroyed it, only for Brian Shaw to match him immediately after. The main difference between this type of bar and the normal bars is the thickness and rigidity. The former means your grip and poor Eddies fingers would be pushed to the limit. The Rigidity means there is much less flex in it, which doesn’t sound like a big deal. The result is, you’re taking the full load much lower/earlier in the lift at the hardest part. It didn’t help that they added a platform to bring the bar to a more standard lifting height. This wouldn’t have helped Brian or Hafthor at all, and even Eddie at 6ft+ wouldn’t have been fun. After JF Caron matched the 2013 Record, the remaining men decided enough at 445kg, their hamstrings were suffering and to avoid injury and save some juice for the last few events they agreed to share the points. Over the years Worlds Strongest Man has pulled locomotive trains, boats, ships, cars, trucks, juggernauts and various planes. This time it were a C130 Hercules Jet cracking the scales at a mammoth 40 Metric Tonnes. During the heats, the Truck Pull event were a “mere” 18 Metric tonnes, this bad boy which is used normally to transport Rhinoceros and big game animals and possibly Zyndrunas Savickas 😉 were a beast. When you consider a 18 Tonne Truck would need about 350kg of force to get it moving, you can imagine the forces needed for a 40 tonne plane. Brian Shaw near enough passed out in his harness and needed to be lowered to the ground. None of them made it the full 25m, I this this maybe the first time none of the competitors have actually finished a pull. this would be most galling for Bjornsson who were so very very close, but once that monster rolls to a stop, no one has the energy to get it moving a second time. I had seen a little of this in camera phone footage, and read some reports and it were a tense moment when the 24-26kg kettlebell nearly fell on Hafthors head as he tried to catch it. Seeing it in full high definition is a “woah” woman, what on earth was the mountain thinking, ain’t most measter put out your caved in head back together here. Such a shame that he missed that throw and knocked his stride, I believe he could have scored the full 10 pts and possibly put Shaw off his game with the manic behaviour and display of power to take the top spot. Much like the heats, the final event were The Stones. All 9 men showed good strength, but a few were let down by technique. I think Szymanski and Janashia will improve with time, and Kielszkowski may have to sacrifice some of that speed for a little more power. Licis did really well here, in Strongman terms he were weeks behind Eddie, but with honing his technique I see sub-30 seconds in his future. I can also see Atlas Stones in the fields of his farm where there used to be bales of hay. It were a bit annoying as they didn’t show the times Bjornsson and Shaw achieved so I timed them myself 3 or 4 times and I went with the highest time. They were buckets ahead of the nearest competitor. Seeing these final scores, the Kettlebell Toss could have been the game changer to knock Shaw down and give Bjornsson his first win. I get the feeling The Mountain will be less Viking and more Berzerker Warrior over this, and be playing it over and over in his head. Had it gone Hafthors way, I think the most likely outcome would have been a draw, had Eddie pushed a 450-455 on the deadlift, and Hafthor not fowled up the kettlebells, this would have been a very different ending. Next year, if Janashia, Licis and trhe Polish Duo of Kielszkowski and Szymanski work on their technique and keep developing, 2017 will be an interesting year and the old guard of Shaw, Bjornsson, Zydrunas (assuming he returns) and Hall maybe in for a dust up.